Label boss ‘Forge’ and production partner ‘Integration Now’ step up for the labels 24th release. Using their newly founded ‘The Hybridz‘ project the duo follow up from a massive dubstep/garage release on sister label ‘Solace Records’. This time turning the tempo up to 168bpm and above, the duo give us four straight up drum n bass tracks. 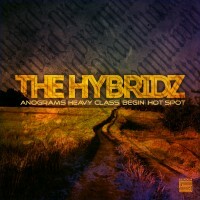 Using their emotive and forward thinking production skills the title track ‘Anograms‘ is laced with tight drum percussion’s and pounding snares. Warm analog bass soothes the track and makes way for the switch up. This track treads a little deeper and is definitely one for the sub heads! ‘Heavy Class’ does as the name suggests. Heavy midrange bass stabs drift over an off beat rhythm coupled with a haunting pitched vocal sample. One of the more dancefloor vibes on the E.P this track does serious damage on the floor. The 3rd track ‘Begin’ is the mellowest of the E.P. Shimmering chords wave over delicate pads and atmospheres, glitchy drums and jungle edits work in with the main groove to give it a minimal/jungle feel. Don’t worry this track still carries the trademark sub work out. arrangement turns us straight into the drop after a few bars. With distorted square waves, filtered beats and nasty FX all working in conjunction with the melodic vocal sample that drifts in and out of the track. A perfect tune for the quick mixing DJ.